One of the greatest allures of the Instant Pot is not just the ease with which it produces soups and stews, but its ability to make puddings, breads and yogurts. This versatile appliance coaxes creativity and the desire to make healthy comfort foods in a new and easier way. Bread pudding calls to me each fall and winter. The Paleo, grain-free version (that I provide a link to below) I love best because it’s quite high in protein. So I can eat it for breakfast with warm raw milk poured over it, and a drizzle of pure maple syrup. Ethereal pleasure: substantial dessert. You’ll also love the sautéed caramelized pears topping option, so special this time of year. Dessert, breakfast or snack? How will you enjoy it most? 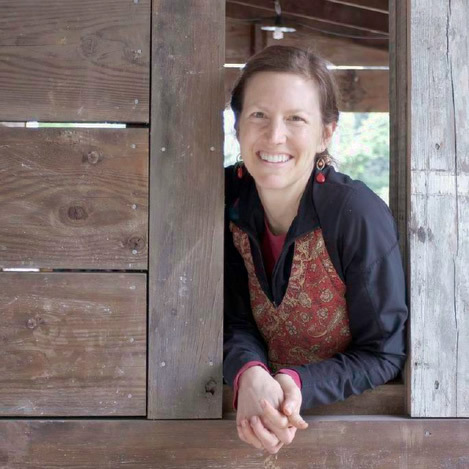 1 loaf bread grain-free, sourdough, gluten-free-- your choice! See link below in Recipe Notes for recommended grain-free bread loaf option. Cut bread into 1" cubes. Select bowl that will fit into the Instant Pot's stainless steel inner pot. I used a metal bowl with sloping sides that is about 4" high and 7-1/2" wide across the top. Place a piece of parchment paper into the bowl, pressing flat any folds. Add cubes to lined bowl. Place the following items into blender: milk, eggs, yolks, maple syrup, vanilla and sea salt. Blend for 10-15 seconds, then, with motor still running, add melted butter through the door in lid. Add 2 cups water to Instant Pot's stainless steel inner pot. Place trivet into Instant Pot. Place bowl with bread on top. Pour custard into bowl, pressing on bread gently so as to wet all the cubes. Place a small square of parchment paper over the surface of the pudding, and fold in any corners from the bottom piece that may be sticking out. Place lid on IP. Seal and close vent. Press Steam button and adjust the time to 15 minutes. When timer goes off, allow the pressure to release on its own for 20 minutes; then press Cancel button and open pot. Allow bowl to cool slightly, then remove pudding by lifting up on the corners of parchment that line the bowl. Transfer to a plate and flip over, so the bottom is the top. Slice and serve, with optional caramelized pears. Whipped cream would also be a lovely accompaniment. Here's the Instant Pot model I use. Here's my favorite grain-free sandwich bread, which makes this dessert/treat/breakfast very high in protein. And if you’re so inclined, the seasonal pear side/topping (of caramelized glory) is not only amazing to eat, it’s a really lovely process to make. 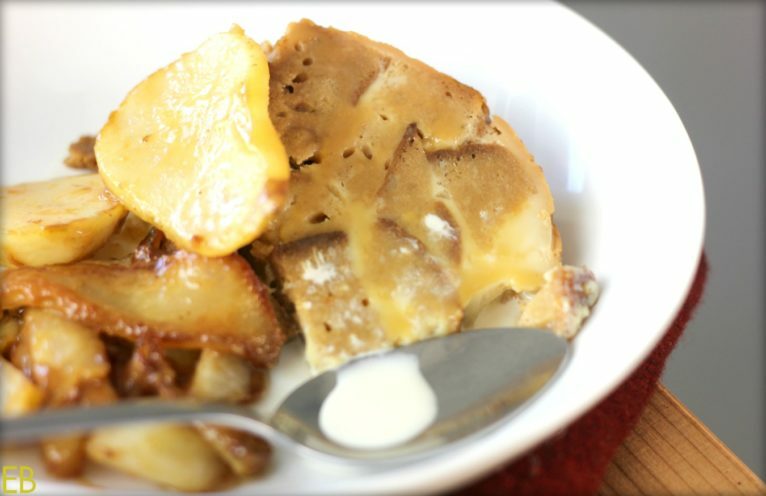 What I’ve done in the past is to make the pear topping for the first time we eat the bread pudding… (it’s so special! Make it for someone you love!) And then we eat the generous bread pudding leftovers for breakfasts and snacks, with milk or cream poured over the top, and a bit of maple syrup or honey. Melt butter in large cast iron skillet over medium-high heat. Add pears and sea salt. Saute until pears begin to brown and soften a bit, about 8-10 minutes. Reduce heat to low. Add maple syrup, stirring to coat. (Be careful; the pan's contents will sizzle and steam a bit.) Add vanilla. Add cream and de-glaze the pan, using the steam and your spatula to scrape up any bits that are stuck to the pan. Stir in bits, and turn off heat. 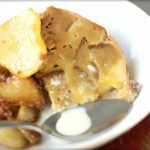 Garnish bread pudding with pears and sauce. Oh my! My girls would LOVE this! And those pears to go with are just perfect! Oh my goodness can I please come stay with you?! This made me swoon. I love your food so much! LOVE this recipe!!! WOW. I’m with Emily.. We need to plan an iPot party and swoon together. ONE more reason to purchase one!! Megan, I just made this for our belated Christmas breakfast. I couldn’t wait to comment. It is DELECTABLE. I added raisins in with the chunks of sourdough bread, a tablespoon of cinnamon in the custard, and instead of pears, used 3 ripe bananas. Oh my word. It was incredible. Thank you for sharing reliable, easy to follow, and delicious recipes!!! Yay!! So glad to hear it!! Delighted. 🙂 Thank you for sharing your experience and variations! My family would love the bananas! I had to laugh when I was making this, because of course I made so many substitutions. I’m waiting for it to come out of the pot and cool down enough to taste but I can’t imagine that it won’t be just fine. First of all I had to cut the recipe in half for my 2 qt pot. Then I used vanilla coconut creamer instead of vanilla or sugar or milk. I really do need to get a larger pot so I can make all these desserts. Next I’m trying the tapioca and the rice pudding. Thanks for the inspiration. Ha, I know how that is, Callie! 😉 I hope it turned out great. You’re welcome and best! What could be better than warm bread pudding for dessert (or breakfast!)?? I just love the Paleo bread option, too! Ha, I agree! I really love it for breakfast best, and that it’s all ready to go when we’re hungry! Thank you! Whoa this looks insanely delicious! I could go for some of that right now! Yum! Gasp! I actually never had bread pudding- can you believe it? Looks tasty though! This is a good one to start with Shelby, because it’s wholesome, healthy and yummy. When I was younger I liked the bread puddings that were really gooey and sweet. But I don’t love sugar anymore. I much prefer wholesome comfort foods. I hope you enjoy this version. 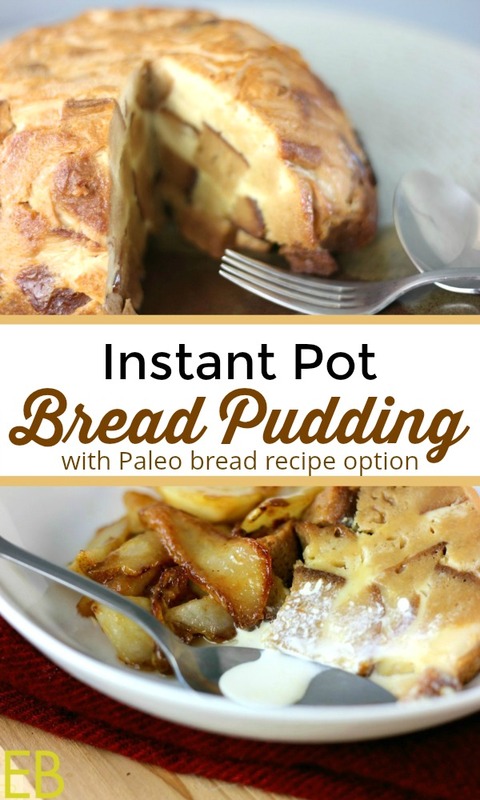 I love bread pudding but have never made it in the instant pot! What a great idea! Thanks Nadia! I agree. 😉 Enjoy!! I, too, love how versatile the instant pot is! This bread pudding looks so comforting and delicious! And the sauteed caramelized pears are divine! Thank you Jessica. I love fall and cooked pears!! Super excited for this time of year and all the cozy foods like bread pudding! Yes, so true about the IP!! Thanks for your comment! I LOVE me some bread pudding. I love me some Instant Pot! You see where I am going with this…? I cannot wait to tryt his recipe out!